Martyn Moxon says that 'first and foremost we've got to win the title' that's the priority (Picture: Vaughn Ridley/SWPix.com). YORKSHIRE chief Martyn Moxon is challenging his players to turn 2015 into a record-breaking season. 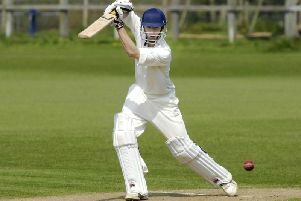 The club is on course to break a clutch of records as it continues its pursuit of the County Championship title. n If they win three of their last five games, Yorkshire would achieve more victories (11) than any team has managed since the Championship was split into two divisions of 16 matches per county. n If they gain another 59 points (with 16 points on offer for a win, five for a draw and eight batting/bowling points available per match), Yorkshire would set a new record for the most points in two-divisional cricket, beating Somerset’s 266 in Division Two in 2007.
n If they gain another 50 points, Yorkshire would beat the previous best First Division total of 257 by Sussex in 2003.
n If they avoid defeat in their last five games, against Sussex (away), Somerset (home), Middlesex (away), Hampshire (away) and Sussex (home), Yorkshire would go through the entire season unbeaten for only the second time since 1928.
n And if they win their next match, having now won six on the bounce, Yorkshire, by my calculation, would achieve their best Championship sequence since they won eight games on the trot in their title-winning year of 1946 in the first season after the Second World War. Yorkshire last year fell just short of achieving the most points since the move to two divisions in 2000, finishing on 255 points after eight wins, seven draws and one defeat. Now they are set to create new standards despite a general feeling at the club that the team, although hugely impressive, have not quite played as well as they did last year, particularly in terms of their top-order batting, which has struggled to provide consistent platforms. Moxon, the county’s director of cricket, refuses to accept that the title race is done and dusted and is warning his players to guard against complacency going into the closing weeks of a memorable campaign. But he has every confidence in their ability to finish the job and, hopefully, create a few slices of history along the way. “First and foremost, we’ve got to win the thing – that’s the priority,” said Moxon, who has transformed Yorkshire’s fortunes in recent times along with first-team coach Jason Gillespie and captain Andrew Gale. “There’s still a lot of points available, and we probably need to win two of our last five games to make absolutely sure (of the title). “Some teams could take points off each other as well, so there are various permutations that could come into consideration. “But the bottom line is, if we continue to win ourselves, it doesn’t matter what the other permutations and possibilities are. “As I said when we won the Championship last year, I feel that this squad has got the chance now to put itself in the history books, for the modern generation to be talking about this group of players as the generation of the Fifties and Sixties talk about the Yorkshire team of that period, so that’s our ultimate challenge, to have that legacy. “And finishing the season strongly now would be another brick in the wall of providing that legacy. Moxon, who believes that it would be a greater achievement should Yorkshire win the title this year, having lost so many players to international call-ups, particularly at the start of the season, is adamant that the county’s bowling strength this summer has set them apart. There is talent throughout the team, but the old cliche that you have to take 20 wickets to win a first-class match is not a cliche for nothing, and Yorkshire have been indebted to the core bowling group of Ryan Sidebottom, Jack Brooks, Steve Patterson, Tim Bresnan and Adil Rashid, with others chipping in at crucial times. “The bowling has been outstanding,” said Moxon. “I think the group of bowlers are the big reason we are where we are, so you’ve got to give them a huge amount of credit. “As a team, we haven’t batted anywhere near as well as we did last year, and obviously we haven’t had that Adam Lyth/Alex Lees partnership that was so successful for us at the top of the order last year. “We’ve struggled more with the bat, but we’ve still managed to get totals good enough to win us games on the back of that excellent bowling. “People just seem to have that knack of stepping up at key times, rather than us having had a real consolidated amount of success from the top-six batsmen. “We haven’t seen that very often, in truth, so there’s definitely areas we can still improve.